So many things to do during the holiday season, including shoveling our first snowfall of the season today. Here is one easy way to keep fueled with delicious and healthy foods, including a relative of kale called rapini, that are a snap to make for supper. I purchased a large bunch of fresh, locally grown rapini (sometimes called broccolini) at our local farmers market this morning grown by Jonathan and Karlene Goetz of Riga, MI, in their hoop houses. I always look but usually pass by the tiny bunch of rapini at the grocery store, shipped from California, that sells for $3.99, but this enormous bunch was only $2.00. Karlene assured me that they would be showing up every week during the winter, and I assured her that I was a "regular" and would also show up to purchase fresh greens all winter long. Now that is a relationship that is truly "Made in Michigan!" Serve with additional freshly grated hard cheese (not really necessary), fresh crusty bread, and a salad, if desired. Also very good and filling all by itself. These amounts made enough for 2 very hearty servings with one serving left over for lunch tomorrow, which will be very tasty to eat either warmed up or chilled. Where kale and delicious relatives like rapini are more than decoration on my plate! 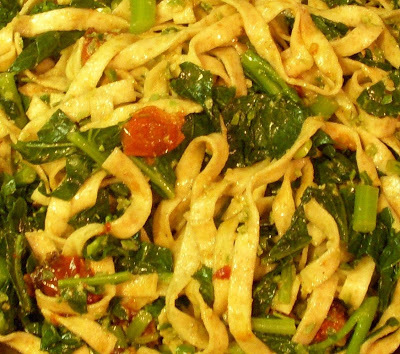 I make a version of Kale/Whole Wheat Fettuccine too. I use tiny slices of lemon (sauteed with garlic), some red pepper flake, and toasted walnuts. I also totally LOVE the Al Dente Whole Wheat Fettuccine (which cooks in only 3-4 minutes and tastes like I made it myself). It's also a local company. Give it a whirl! I cook the kale for a minute or so before I throw in the pasta, by the way, then save some of the pasta water for the finishing with the lemons, garlic and red pepper flake. Kalamata olives and some nice Reggiano also are great with this dish. 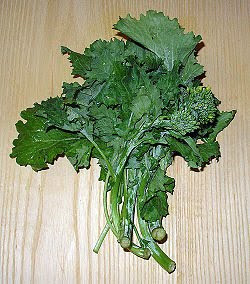 It's nice to see a shout out to rapini...I grew a whole bunch in my garden and it was really good. Very easy to grow!